Serve modern and engaging ads with direct sales opportunities. Get true large-scale ratings data and brand monitoring. Engage viewers, build community. Monitor distribution and monetize. Serve your customers with add-on entertainment and relevant ads. Deliver on the promise: Truly Smart TV. Serve your users and capture the 21st century market. Ready to deploy. We revolutionize video consumption on TV and other devices by providing perfect content identification, content-based user interactions, rich advertisements, and new ways of monetization. End-users are our top priority. We benefit and engage users, and that’s how we create value for advertisers, device manufacturers and market analysts. 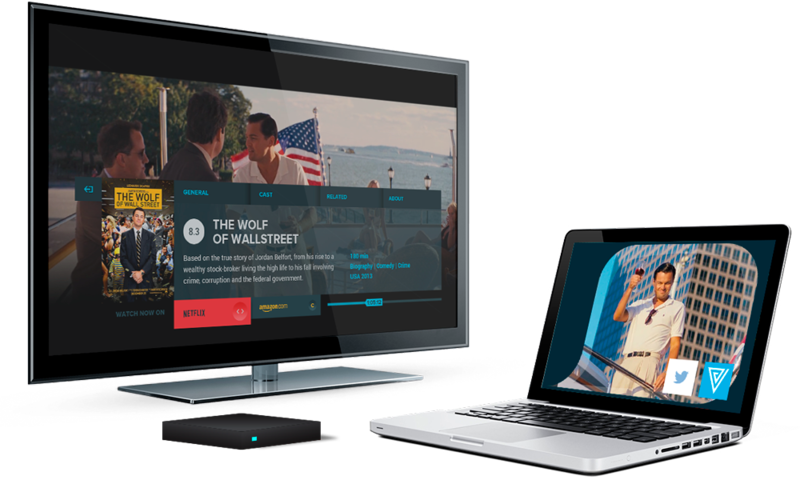 The winning combination is our class-leading content identification with polished Smart TV and mobile user interfaces. The result is a useful, compelling, and new user experience. Videntifier gives new ways of gathering direct user feedback by providing direct interaction with content and quick access to quality metadata. We enrich traditional ads with direct purchasing opportunities. We also deliver fun and deep interactions on social media. And more - What happens when any video timeline becomes a hyperlink? What happens when all users are connected through the content they love through their entertainment devices? Capture true privacy-safe ratings data and provide ads that mean something. Interactive ads with attractive offers engage customers directly. Instantly analyze audience response. Link timelines directly to social media, deepen cross-branding, and present thematically relevant sales opportunities. For more information about how our solutions can help you improve your marketing, please visit our ad monitoring page. Engage viewers, increase viewership, and build community by connecting your viewers across all media. Serve your users with add-on entertainment and social features like interactive voting and competitions. Increase ad revenue by giving buyers rich ad options with direct sales channels. Analyse viewership in realtime across different distribution channels. For more information about how our solutions can help you get more out of your content, please visit our operator's page. Videntifier is a truly Smart TV experience. Serve your users with ultra-powerful content-based features and a polished device-friendly UI. We deliver a complete Smart TV solution which is resource-effective and ready to deploy on any device. Contact us to bring your portfolio and your users into the future of content consumption. TV and video are purely passive forms of media consumption, and they're hard to navigate. Today's TVs only provide limited support for modern broadcasting (e.g. streaming, Youtube) and intelligence networks that discover links to related content and social media exist are hard to use. At the same time ads are a reason to change channels, instead of catching customers’ attention and providing added benefits aligned with the consumers interests. Videntifier changes all this. Videntifier breaks the mold: We take video sources with unknown content and unify them into one useful and informative experience, fully connected to social media. We give the user interesting information, relevant opportunities, and a fun experience. Our first priority is a high-quality end-user experience: Unique functionality, polished design, the highest performance, and all privacy concerns addressed. Our industry partners, device manufacturers, and broadcasters act as a link to the advertisement industry. Everything is connected, everyone benefits. Videntifier-powered Smart TV connects visual content across multiple sources and platforms. And viewers with that content. Videntifier is media identification at a totally new scale: Powerful, interactive, and value driven. Contact us and join in.